Anybody who smokes may want to know how smoking affects their sleep. Well, smoking has a lot to do with sleep quality. However, many smokers think that smoking is enjoyable and relaxing. Just like vaping, smoking delivers nicotine to the body. A vape cartridge or an e-cigarette cartridge is a system that is designed to provide body with the nicotine. Thus, when you use vapes, you inhale heated vapor or chemical aerosol that contains nicotine. Nicotine is an addictive substance that makes it hard for smokers to quit smoking. Even when a smoker knows the health benefits that they stand to enjoy when they stop smoking, nicotine addiction makes ending the habit difficult. Generally, smoking has several effects on the sleeping pattern of the smoker. In addition to the nicotine that is known to be present in tobacco, other chemical compounds are used to create vapor cigarette flavors. These can irritate the lungs leading to lasting breathing problems. Such problems may include chronic respiratory diseases like a nagging cough or bronchitis. A smoker can also develop asthma or COPD. Coughing can disrupt sleep while causing other health issues. According to the World Health Organization, people that sleep less than 7 hours are at the risk of heart attack or stroke. Research has shown that smoking tobacco has the potential to change how clock genes express themselves both in the brain and lungs. This can hinder the ability of a smoker to enjoy a restful sleep at night. Increased exposure to tobacco worsens any disruption of the circadian clocks. That’s why smokers have difficulties falling asleep and waking up. The effects of circadian rhythms’ disruption may include the risks of other conditions such as mood disorders, anxiety, and depression development. Smoking increases the possibility of developing sleep apnea and snoring. That’s because the irritants in the cigarette smoke can cause airway swelling; especially in the soft tissues that line the throat and the nose. When cigarette smoke damages lungs, other problems may arise including a decrease in the oxygen level while sleeping. Airflow changes occur when the soft tissues swell leading to their vibration at night which causes snoring. Additionally, when the airways collapse, sleep apnea occurs. This problem can occur in kids when a person smokes near children and expose them to secondhand smoke. Smoking disrupts basic sleep architecture. Sleep architecture refers to the sleep stages’ pattern that a person enjoys at night. Smoking breaks down sleep leading to insomnia. Generally, smokers have longer sleep latency. They also have more slow-wave sleep and they sleep less when compared to nonsmokers. These are common characteristics of insomnia. Which is contrary to the belief that smoking and using electronic cigarette is relaxing. Essentially, nicotine is a stimulant just like coffee. As such, it increases alertness while raising heart rate. This keeps a person awake longer especially when inhaled before bedtime. Since nicotine is a stimulant, smokers can develop insomnia with ease especially when they frequently smoke before bed. Women that smoke more often in their late mid-life are more likely to develop insomnia. NNicotine makes falling asleep difficult when inhaled before bedtime. Thus, it can worsen insomnia. It’s however important to note that some people report that smoking makes them fall asleep faster. They state that smoking relieves anxiety while inducing relaxation. Nevertheless, people respond to the stimulating properties of nicotine differently. A recent study has also shown that some flavored e-cig liquids come with chemicals that have the potential to alter the immune cells thereby compromising the user’s immune system. This means that even vaping can hurt the ability of the body to fight off infections and colds. Ending a smoking habit can be a positive thing, especially if you’re trying to recover a natural sleep quality. In addition to the potential of smoking causing snoring, sleep apnea, and insomnia, it can also affect the overall health of a person in many ways. 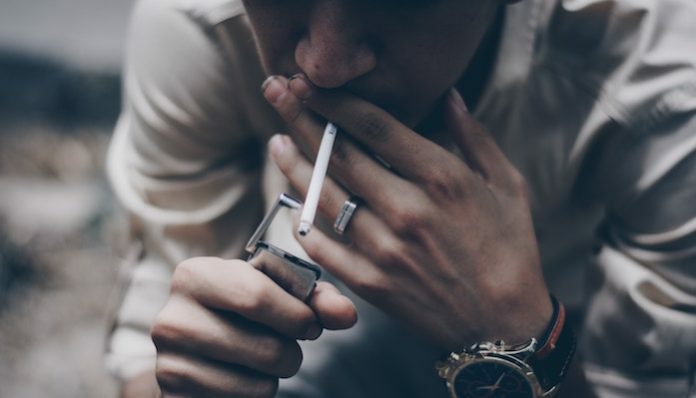 Additionally, kids who are exposed to second-hand cigarette smoke are at the risk of developing frequent respiratory infections, asthma attacks, coughing, breath shortness, wheezing and sneezing. Exposure to secondhand smoke among babies increases sudden infant death syndrome risk when compared to babies that are not exposed to secondhand cigarette smoke. It’s important to note that if a person quits smoking, all problems that are associated with smoking do not linger. Even if the body is already addicted to nicotine, the addition can fade with time. Thus, smokers can still start to enjoy better sleep quality and health benefits that come when they quit smoking.